Oh these sleeves. I got this top well over a year ago, and aside from styling it for outfit photos, I never really wore it. The sleeves are just massive, begging to dip into food, get wet in sinks, and gather up dirt. Fear of the sleeves getting stained or otherwise just making a mess kept this top relegated to the closet. I considered perhaps I should just get rid of it, if I was too afraid to wear it. Then suddenly things made sense, if I'd be willing to let it go, then shouldn't I also be willing to risk it getting dirty? 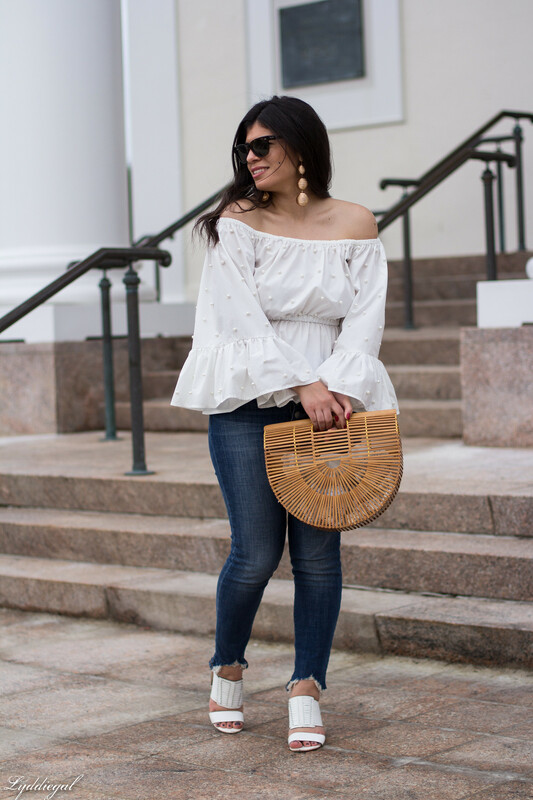 What is the shelf life on an off the shoulder, bell sleeved, pearl embellished top anyway? It was so fun to wear, and once I stopped considering it as precious, I just let myself enjoy wearing it. 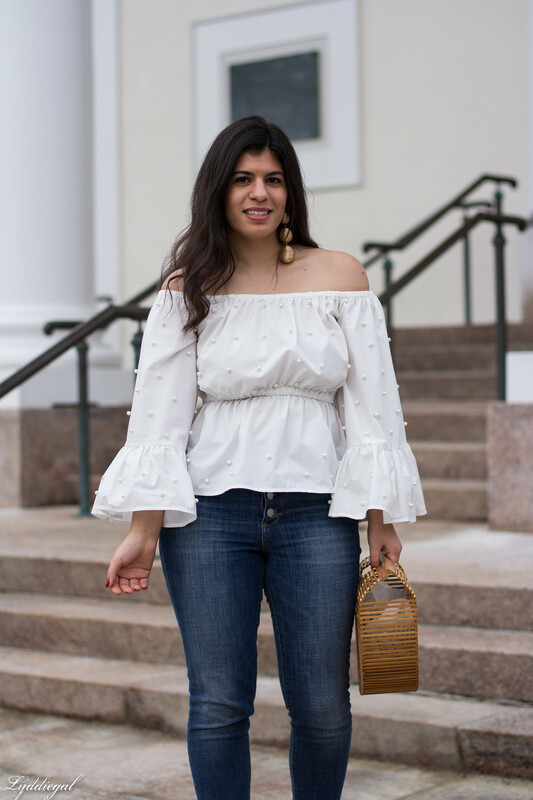 I am probably cursing myself by saying this, but so far, I have not had an incident with a single one of my bell sleeve tops. People are constantly pointing them out to me and asking why I am drinking red wine or eating ice cream or just generally living life while wearing statement sleeves but really - accidents can happen to any item of clothing, so there's no reason to consider our clothes precious. Beautiful things should be worn and enjoyed. And this top is stunning! 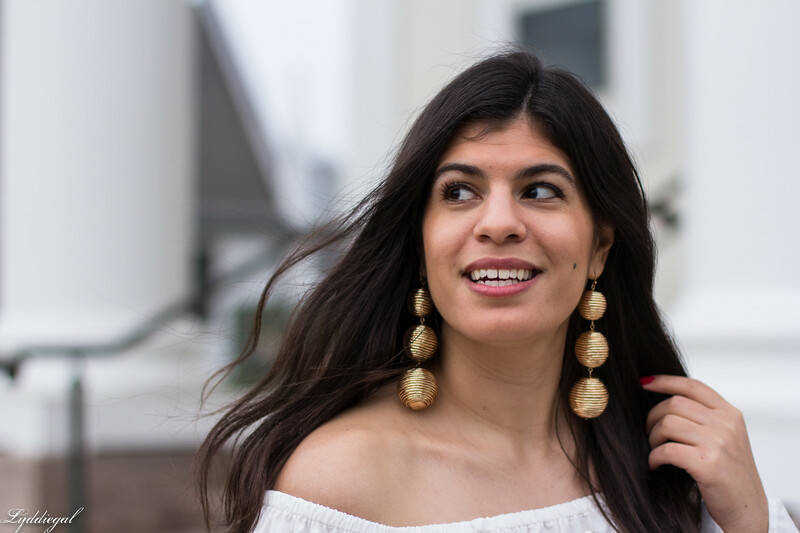 I love the pearl detailing and I love how striking it looks with your statement earrings, which immediately caught my eye all over again, even though I'm sure I've seen them before - they just work so well in this look. That's exactly the perspective we all need, Lydia. For so many things in our lives. How many times do you hear that someone won't wear white jeans because they will get dirty? Everything gets dirty...ha ha!! We need to enjoy life and wear what we have!!! I'm so glad you're having fun wearing that top because it is such an inherently fun piece of clothing! I seriously love those sleeves (I'm developing quite a thing for sleeves lately). You make such a good point! When we are worried about ruining a piece of clothing and don't wear it, we take all the fun out of it (and why buy it in the first place)!? I'm glad you brought this top out to wear. It's gorgeous! It really is so much fun! And so true, things are made to get dirty, but hopefully they don't haha! 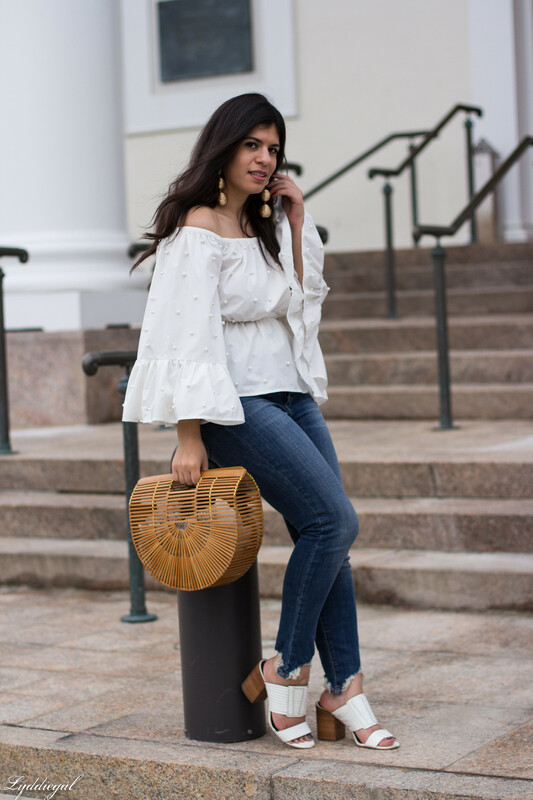 we all need a few dramatic pieces in our closets and this top is so fabulous. You styled it perfectly. Omg I literally had a queso sleeve situation and all I did was just lick off the queso and I was like eh, I'm not going to lose queso over this! I will say though I did have a lot of close calls with the stove this past fall so I doooo recommend not exactly working in a kitchen with bell sleeves! Such a fun and fab casual look you got here dear. 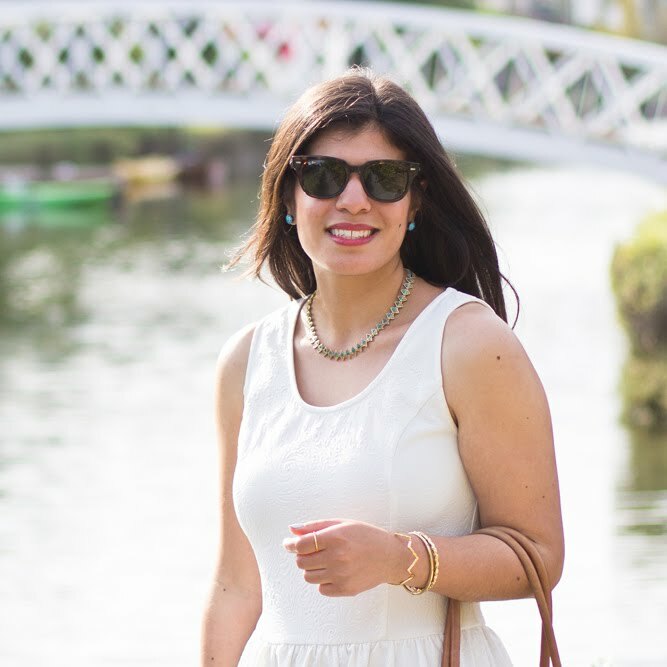 Loving the pearl embelished white top, super elegant. Love how you tone it down a bit with those trusted denims. 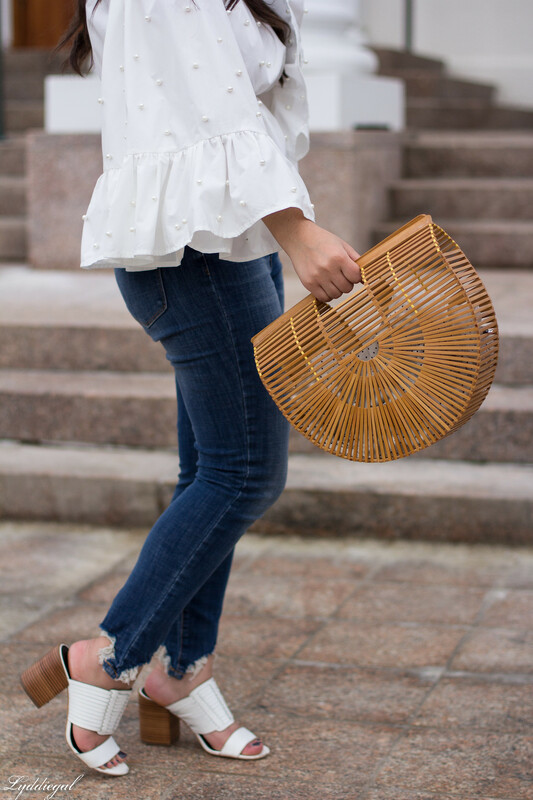 Cute sandals to pair with the top too! I agree with you on this! 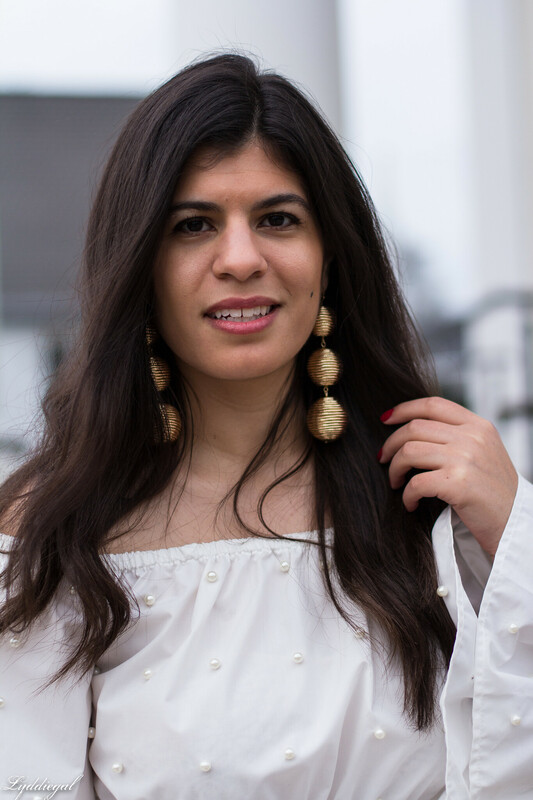 It's fun trying different trends and some might be less wearable, but it you buy it I definitely think to have fun with it! 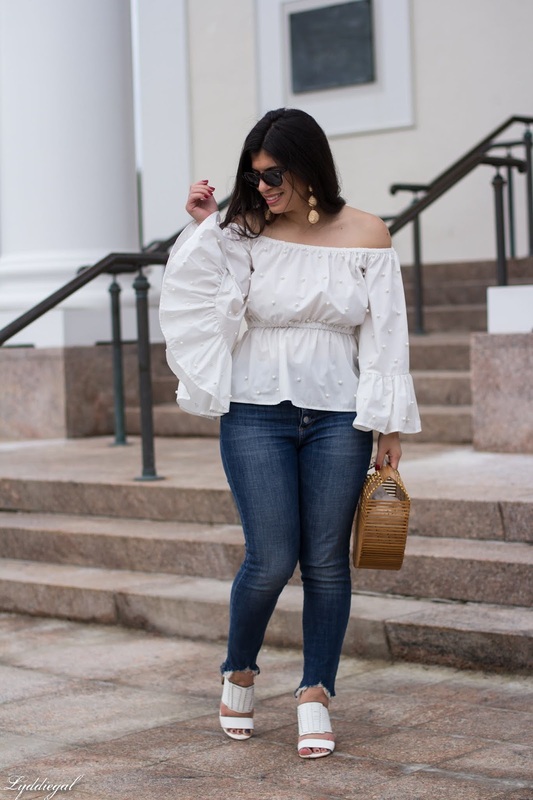 These sleeves are so fabulous and fun! You look great!!! 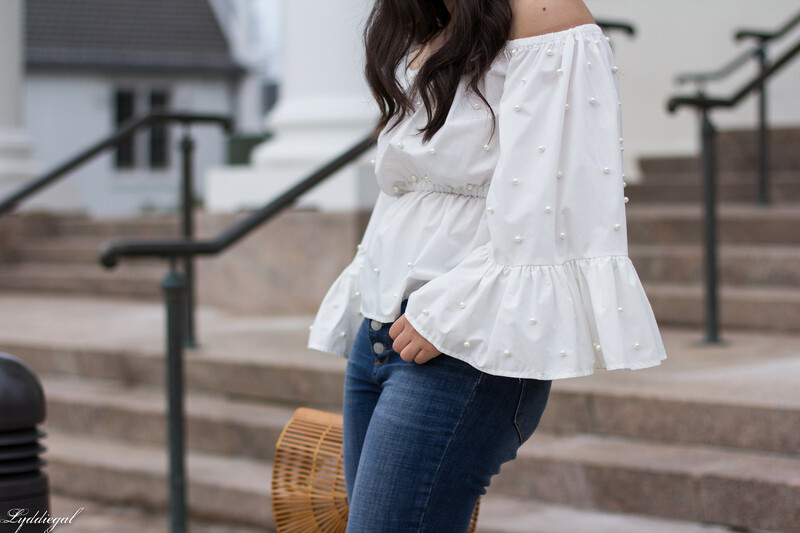 This blouse is so pretty and feminine thanks to the awesome sleeves. I love it! Good thing you decided to wear it because it's really beautiful for the summer. The pearl detail and the sleeves are awesome - like you, it would have taken me time to wear as i'd be thinking about getting it dirty too.. I have a few shirts with similar features- it DOES make 'em tough because it really limits where you can wear them! I do love the drama of this look, though- so pretty! Lydia, this post is the best. 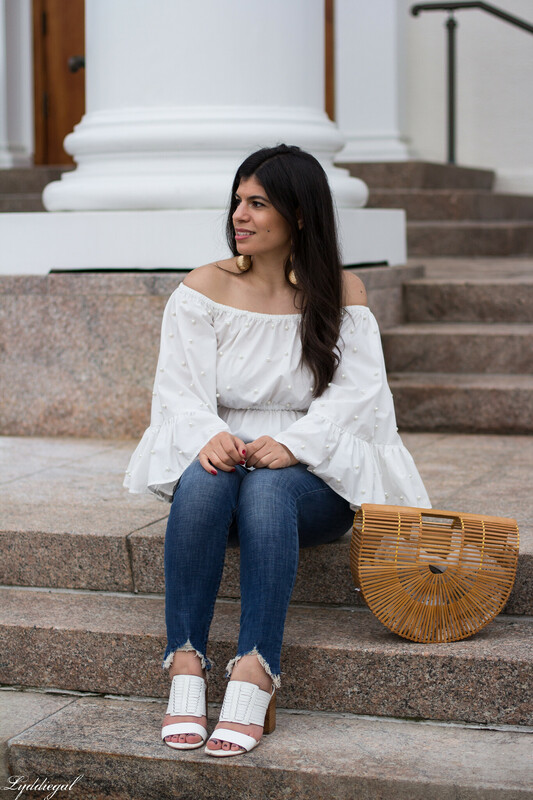 Because I am in love with this outfit--the top is SO MUCH FUN and I love the earrings, shoes, and bag too. But more than that, this is such a great life lesson. It sounds so silly, but I do this all the time--"save" things that I'm afraid I'll ruin or because the occasion/use isn't "special" enough and then you know what? They never get used/worn!! I'm going to also vow to do this more--wear the "special" clothes, use the "special" candles/pens/plates/etc. Thanks for the inspiration! Beautiful! Have a great tuesday, dear! Such fun sleeves! Glad you decided to just let yourself enjoy it! I'm always obsessed with your style. Gorgeous look you got there. Thanks for the idea dear!